How to Look After Your Gym Shoes? Even if you run in designer clothing, the fact remains that your running shoes are the most important item of gear you need for your workout. So here's the guide to prolonging the life of your running or gym shoes. If you do a lot of off-road running over rough ground, think about getting some purpose-built trail shoes. 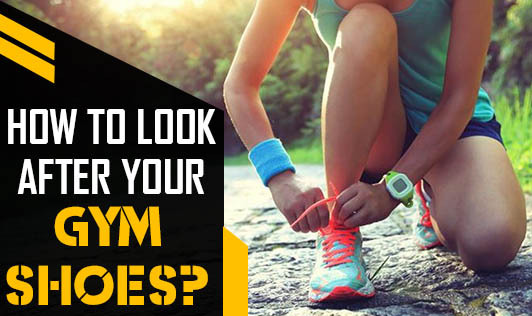 Make sure your shoe doesn't slip off when you are on gym equipments. Leaving shoes muddy and damp actually perishes the rubber and allows stitching to degenerate to the point where it will snap more easily. Just a minute of light brushing under a lukewarm tap will get 99 per cent of the mud and grime off, allowing the materials to breathe and dry naturally. Brush most of the mud off the sole as well and they'll dry more quickly and won't be heavy next time you head out in them. Never put your shoes in a washing machine; you may get away with this a few times but the materials in the shoe will break down and you'll be buying new shoes much sooner than is necessary. If the shoes have got wet through, take out the in-soles and dry them separately. If the shoes are really saturated, it helps to hang them or position them so the worst of the water can run out easily. Try to get the water out of the laces. Never put the shoes in a tumble-dryer or attempt to accelerate the process by placing them in direct sunlight or on a radiator, as this will affect the glues that are used to bind all trainers together. Shoes can literally fall apart if treated incorrectly. Store your running shoes in a dry environment where they will not get crushed or otherwise damaged. Room temperature is best as this will ensure they are warm when you next put them on and the midsole materials will remain optimally flexible. Don't put them in a plastic bag or a box, as this will deny them circulating air, slow down any residual drying out, and cause them to smell. Getting into the routine of caring for your training shoes immediately after a run will ensure that you won't need to replace them as quickly. So maintain your shoes for a satisfying and effective workout!